This cabin was very cozy and I loved the layout. However, I didn't like the location of it... it is in a hole and the driveway was very steep. Also, the water pressure in the shower was not good at all! But where it was just a weekend trip, it wasn't a bad place to stay! The layout is very open which I love. It's a great place for couples to stay!! We love Grays Place except the pillows and need a comfortable couch to lay on besides a little loveseat can't wait to come back. Clean, economical older property but well maintained. If location is your priority, this property is a must. Only negative comment is the hot tub. Chlorine was too strong. Mysterious black particles floating in the water. The unit only had a few jets to start with and several of those were not functioning. An upgrade would have made this cabin an almost universal 10 experience. Missed the beautiful views of the mountains. Also you could tell that the cabin hadn't been opened in a little while. But the peace and quiet was awesome. The cabin was great, the staff was great , the owner is a very nice person the only thing I had problems with was getting in and out of driveway when it was raining , a little on the steep side, but we managed, we will use CABINS USA again when we plan a trip. We liked the location of Grays Place, and the decor of the overall cabin is just precious. It’s obvious the owners love the cabin and want others to love it too. The hot tub is perfect for just two people and we enjoyed sitting out on the porch. Well stocked kitchen too. We would return if it weren’t for two things: the bed for one. We just couldn’t get comfortable on it and ultimately were glad to only be there for two nights. The other was the crazy high humidity in the cabin itself. It was less humid outside than in with all the windows shut and ac running. I had a small box of caramel corn that stuck into a glob despite being closed up, and the bedsheets always felt wet. The house desperately needs a dehumidifier. Really enjoyed our stay. Very clean and friendly staff. Had all the necessities needed to stay. Just wish there were more towels, that they had wifi, and not all the channels blocked on the tv. Other than that we really enjoyed our stay! This cabin was so perfect for our trip. It's close to Pigeon Forge but still nestled away from traffic, noise, and other people. The cabin was very clean and we loved that there was a hot tub and washer/dryer. The bed was very comfortable, and there was extra blankets. We loved that there was so much space, for being a one room cabin there was a large kitchen and plenty of seating (2 tables, a love seat, arm chair, large bench, and chairs outside). I would definitely recommend this cabin for a romantic getaway, or if it's just 2 people traveling. The outside was so serene and beautiful. Even though the other cabins aren't far away, they are all separated with tree lines and hills so you feel very secluded. The only cons I have about the property is I wished they had a few more towels. We stayed 3 nights and had to wash our towels ourselves, but it would have been nice to have an extra set of towels for the hot tub. I also think the bathroom needs counter space. There is only one small table next to a pedestal sink, so we didn't have enough space getting ready in the morning. All in all, it is a great property and we really enjoyed staying. We will definitely be back! Check in was a little difficult only because our code had a 1 in it and the 1 on the keypad didn’t work unless you pressed it a certain way and even then sometimes it was hard to get to work. The cabin was very clean. Bed was very comfortable and the hot tub felt amazing!! The cabin itself needs some clean up on the outside. There’s a lot of cobwebs and if those were cleaned up it would look a lot better. Great location. The easiest check out ever! Will definitely use Cabins USA again! My husband and I loved it. The location was perfect. The size was perfect. The privacy was perfect. We look forward to returning. Thank you Cabins USA! 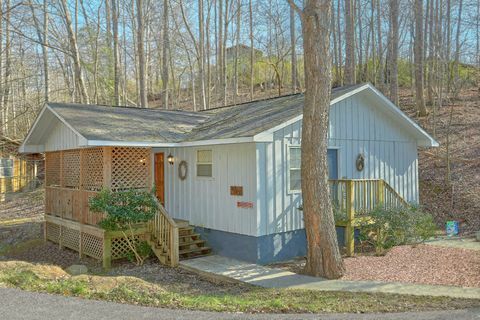 Such a cute little cabin, that is definitely worth the money. I love the studio style for a quick weekend vacation. It feels very secluded, but only 1-2 minutes from the Pigeon Forge main strip. I have no complaints at all, and will be booking again in the future! I know when you are in the mountains you are around all kinds of wildlife.. while we were there we had a bobcat that liked to hang around. It would be out once it got dark and right before the sun came up it would start screaming( sounded like a child screaming). It almost seem to stalk us. It was a little scary at first because I have never seen one up close. They are beautiful animals. Just was somewhat nervous to get in the hot tub once it got dark. The cabin was absolutely beautiful inside and out. Thank you!